Red Greer was a coach and key figure who helped establish Tucson High School as a national power in high school football. He began coaching in 1937 as an assistant coach under Rollin Gridley and became the Badgers’ Head Coach in 1948. He coached until 1955 and complied a record of 39-28-1 and guided THS to state championships in 1951 and 1952. He became THS’ first athletic director in 1956 and held that post until he retired in 1975. In addition to football, Red coached the Badgers’ Boys tennis team, which won six state championships (1938, 1942, 1945, 1946, 1947, and 1948). He moved to Tucson after one year of college in Arkansas and played football at the University of Arizona. He was an All-Border Conference defensive end (1931-33) for the Wildcats. Red also earned two letters as a Wildcat baseball player as an outfielder and catcher. After graduating, Red coached one year at Marianna, Ark., High School, two years at Prescott and then joined Tucson High School. 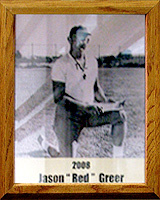 Red was inducted into the University of Arizona Sports Hall of Fame in 2006. Red Greer passed away in 1982.